Not going to lie, I pinched this from my sister's tumblr fashionthoughts (which if you don't follow, you really should as she has an amazing knack of finding better shots from shows and street style than anyone else I know). This is a lovely little quick-step guide to Parisian chic. 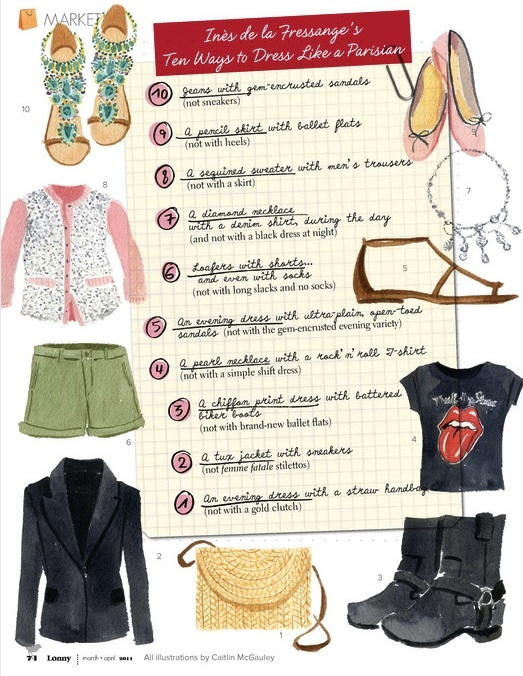 10 steps, all that fit in an overnight bag for un weekend break en Paris (cr*p french, sorry). This book is by Ines de la Fressange, and is a gorgeous little way to get quick fix concept fashion looks. Recommend it, and the illustrations are gorgeous. Find it interesting that her 10 steps above are very similar to South Molton St Style philosophy.